The Manfrotto 303 QTVR Panoramic Head Kit permits the photographer to take sequential constant-angle shots around a single axis with his or her camera either in portrait or landscape position, and with the nodal point of the camera/lens in line with the center of rotation to ensure that parallax effects do not cause problems during image stitching. The kit is based around the 300N panoramic head which allows the operator to set 10 different angles of rotation; 5,10, 15, 20, 24, 30, 36, 45, 60 & 90° (respectively equivalent to 72, 36, 24, 18, 15, 12, 10, 8, 6 & 4 shots) spanning 360 degrees rotation using the engraved, graduated scale markings for reference. 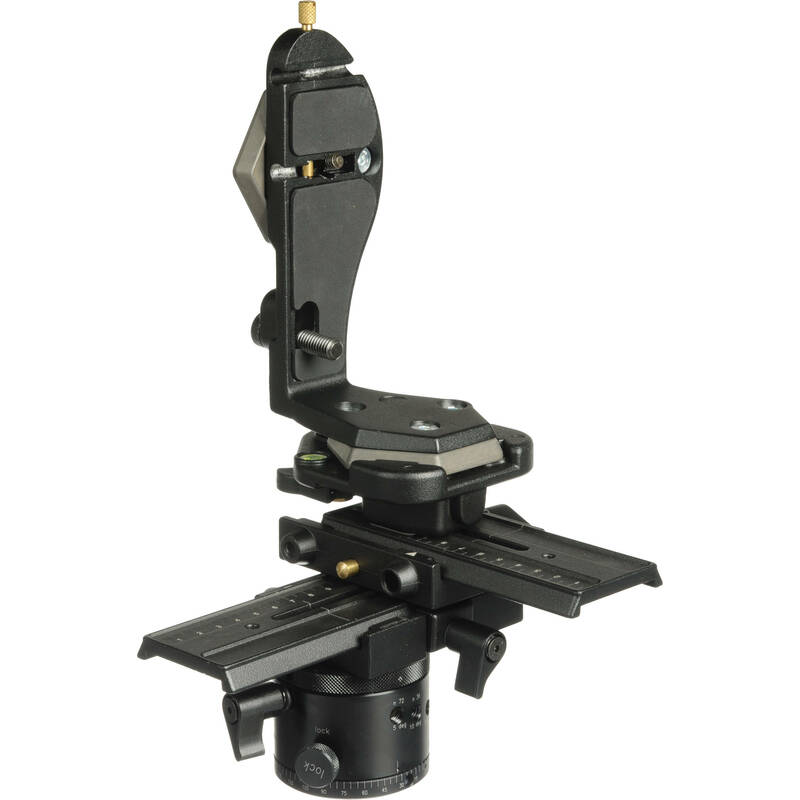 The kit features double sliding plates with 3.1" (80mm) of adjustment for precise nodal point positioning. 303 QTVR Panoramic Head Kit - Supports 11 lb (5kg) is rated 4.9 out of 5 by 9. Rated 5 out of 5 by Anonymous from very useful for panoramic heads! Getting used to this head is pretty easy after you read the instructions and get used to the functionality for the first time. The construction is solid and sturdy, everything works smooth and is great. One thing that would be great with this head would be if it came with a built in level. Rated 5 out of 5 by Anonymous from Price is high but worth it This is an easy to use, quality built Panoramic Head. The ease of changeover from vertical to horizonal is a unique feature that sets it apart. Rated 5 out of 5 by Vladoskan from The ultimate weapon for panorama Make a panorama becomes a child's play, the settings are easy, numerous and very precise. Rated 5 out of 5 by Coonzy from A very sweet set up! This piece of equipment has allow me to reach the next level in my panoramic imaging. Finding the nodal point has never been easier when using the 303 QTVR Panoramic Head Kit. Rated 5 out of 5 by Higherfly from Excellen product super precise and solid That's the best panoramic head I have had: you can do anything in a repeatable and reliable way. I use it mainly for virtual tour photography. I never miss a shot. Extremely strong but (of course) somewhat heavy: it needs a stable tripod. Rated 5 out of 5 by Pixbymax from 303 QTVR Panoramic Head Kit A great tool to own, It made shooting virtual tours and panoramic way more precise and easy.... After using this product the stiching of my images looked stunning. great to own if you are into Real estate photography. Rated 5 out of 5 by antonius from i would suggest this product to anyone This is a vary good product to own, its a bit on the heavy side and bulky to store in a travel pack. Rated 5 out of 5 by Anonymous from Pan Head I haven't used as yet. I will be shooting virtual tours.